Spider mites are small arachnids related to spiders and are common in hot and dry conditions. Roses under heat and drought stress are particularly vulnerable to attack, special attention should be given to roses in pots during particularly hot periods to avoid infestation. This pest feeds and breeds on the underside of rose leaves. The two-spotted spider mite, Tetranychus urticae, is orange, green, or yellow, with two dark spots on the sides of the body. They have a rasping mouthpart with which it pierces the epidermis of the leaf causing leaves to appear yellow or bronze. During severe infestations webbing over blooms, stems and leaves is visible. Defoliation of especially the lower leaves occurs if left untreated. Extreme infestation and continued drought conditions can cause the entire plant to die. To the naked eye, when exposing the underside of the yellowing leaf to sunlight, the two-spotted spider mites look like tiny, moving dots; however, you can easily see them with a 10X hand lens. Like spiders, mites have two body segments and eight legs. Adult females, the largest forms, are less than 1mm long. 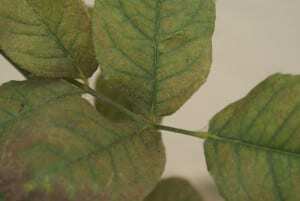 Spider mites live in colonies, mostly on the under surfaces of leaves; a single colony may contain hundreds of individuals. The name “spider mite” comes from the silk webbing that this species produces on infested leaves. The presence of webbing is an easy way to distinguish them from all other types of small insects such as aphids and thrips, which can also infest leaf undersides. Adult mites have eight legs and an oval body with two red eyespots near the head end. Females usually have a large, dark blotch on each side of the oval body and numerous bristles covering the legs and body. Immatures resemble adults (except they are much smaller), and the newly hatched larvae have only six legs. The other immature stages have eight legs. Eggs are spherical and translucent, like tiny droplets, becoming cream coloured before hatching. Drought stressed plants are more prone to infestation. Spider mites cause damage by puncturing rose leaves with their slender, pointed mouth parts, sucking the chlorophyll-containing fluids from leaf cells. Older, lower leaves are more prone to attach and will show signs of infestation first. As numbers increase, the entire plant can become infected. 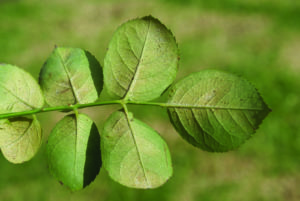 A small number of mites usually isn’t reason for concern, but very high populations—levels high enough to show visible damage to leaves—can damage plants and cause total defoliation. At first, the damage shows up as a stippling of light dots on the lower leaves; sometimes the leaves take on a bronze colour. As feeding continues and the mites spread, the leaves turn yellowish or reddish, curl and drop off. Often, large amounts of webbing cover leaves, stems and blooms. 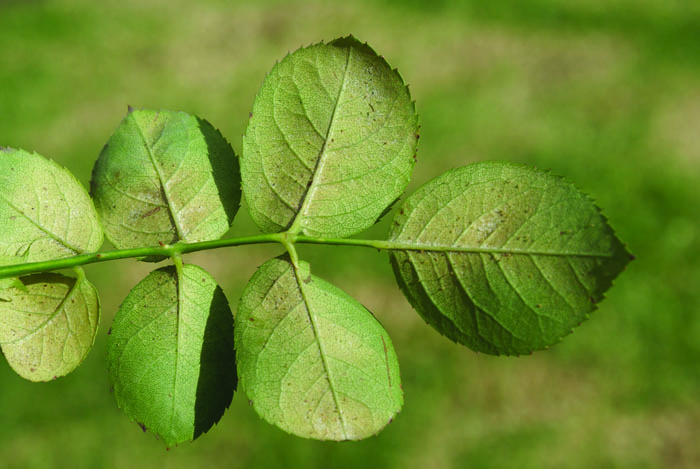 High infestation and eventual loss of leaves will severely affect the roses’ ability to photosynthesise, produce new growth and shade its stems from extreme heat which can lead to secondary problems such a sunburn and stem canker. 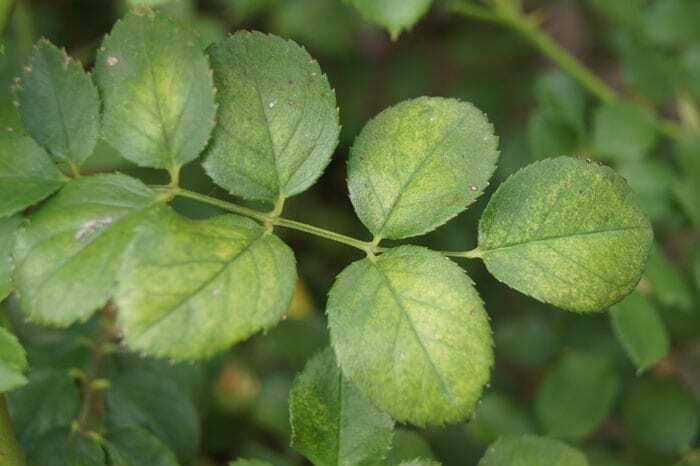 Spider mite populations can build up tremendous numbers and can decimate roses in a very short time if the conditions are right and left untreated. Their numbers increase rapidly during the hot summer months when plants become water and heat stressed. Spider mites prefer hot, dry and dusty conditions so plants adjacent to dusty roadways or at margins of gardens where irrigation is inadequate are most susceptible. Poor air circulation due to overcrowded rose beds will also increase their numbers. Roses in pots are particularly susceptible to infestation during the hot summer months. High humidity reduces their activity and subsequent threat and as such, overhead irrigation during dry periods is very beneficial in keeping populations in check. Figure 1 Spider mite life cycle. Development of a typical plant-feeding spider mite. The stage that hatches out of the egg is called a larva. Remaining immatures are nymphs. 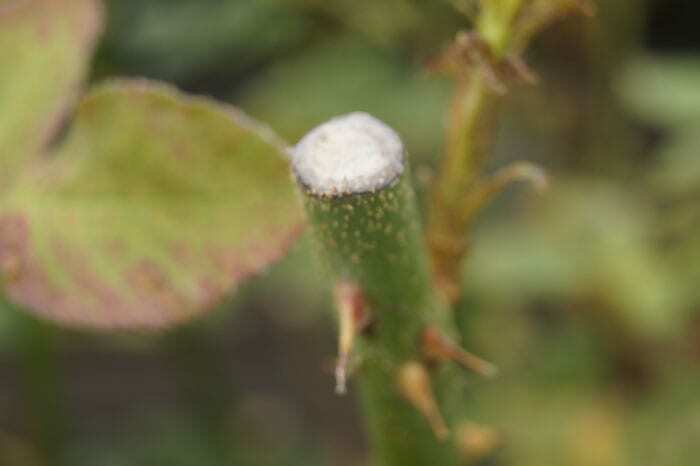 In warm sup-tropical areas in South Africa, spider mites may feed and reproduce all year on roses that aren’t pruned or retain their green leaves throughout the winter. In colder areas, where roses are pruned and all remaining leaves are removed, red spider mite overwinter as red or orange mated females on surrounding plants and in ground litter and leaves. They begin feeding and laying eggs when warm weather returns in spring. Eggs are laid on the underside of leaves. Each adult female can produce more than 100 eggs in 3 weeks. They reproduce at alarming rates – 10 spider mite in December are capable of becoming 1,000 by January & 100,000 by February if left unhindered! As foliage quality declines on heavily infested plants, female mites catch wind currents and disperse to other plants. High mite populations may undergo a rapid decline in early autumn when predators overtake them, host plant conditions become unfavourable, and the weather turns cooler. Since plants stressed by heat and drought are most vulnerable to attack, deep drenching, regular watering will prove most effective in keeping red spider mite at bay. Overhead irrigation during this time of year will be especially useful in keeping ambient temperatures lower and increasing humidity. A thick mulch of peanut shells, pine needles, bark or crushed apricot pips will retain moisture in the soil for longer and help keep the roses roots cool further minimising heat stress during the hot summer months. 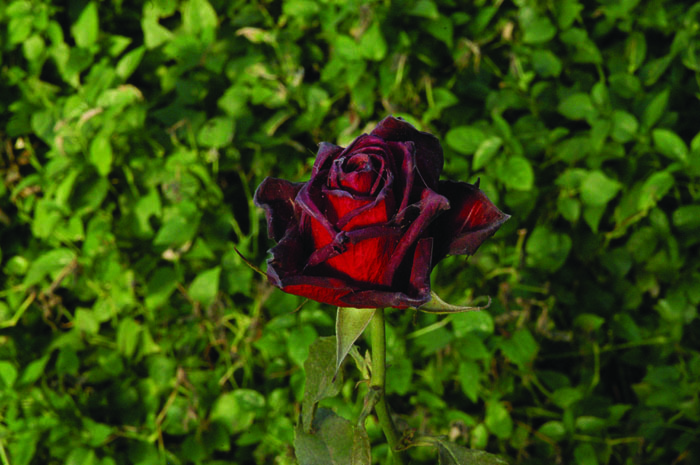 Avoid overcrowding rose beds where air circulation is limited. Roses in pots should be watered on a daily basis – water pots until you see water seeping from the drainage holes. It is not recommended to place pots directly in drip-trays as this will hinder proper drainage, simply use ‘pot-feet’ or bricks to raise the container out of the drip tray. Should infestation occur, use a high pressure jet of water and regularly spray the undersides of the rose leaves with water – this will render the leaves an unfavourable breeding ground and minimise heat stress. Minimise the use of general insecticides as these products will greatly reduce natural predators of red spider mite. Spray the underside of the leaves, concentrating on the older lower leaves then move upwards to the newer growth with Ludwig’s Organic Insect Spray. Spray at least twice, five days apart to control immature and adult mites. Use 50ml in 10 litres of water. For high infestations use : Milbeknock, it will control all life stages – usually a single application will suffice. Use 12.5ml in 10L of water. Spray only when infestation is present and not as a preventative measure. Or Ludwig’s Spider Spray – 5ml in 10L of water – control eggs and immatures – spray twice – seven days apart in hot weather. Spray only when infestation is present and not as a preventative measure. Remember to read enclosed pamphlet for more detailed information on products and procedures.